Exporting data is easy in myphoner. Choose whether you want all data or scope it to certain criteria and get it delivered to your email within minutes. To export your data, simply go to Export/Move in the context menu of the list. The context menu is the button you see in both the Manage Lists screen, and the Work screen. When viewing the list, its context menu is available from the submenu (see screenshot). You can also limit the data by selecting some criteria, for example that you only want Won leads to be exported. Then press Run Now to run the export and get it sent to your email address. 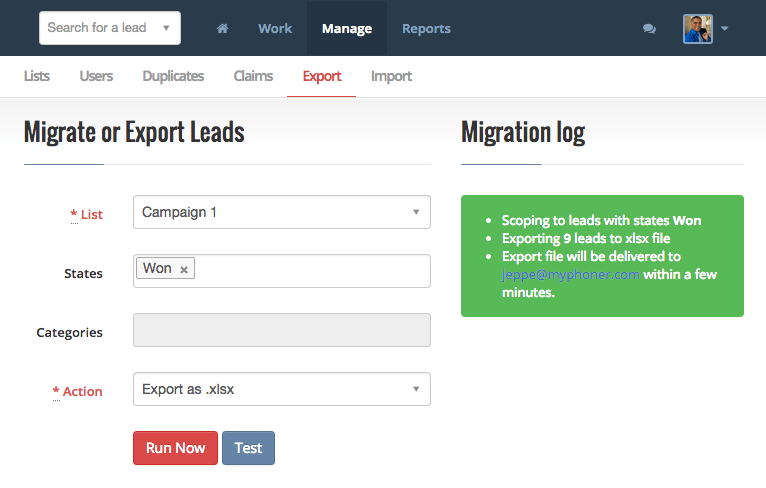 After running the export, you'll get a log, showing how many leads matched your criteria and whether it was successful or not. 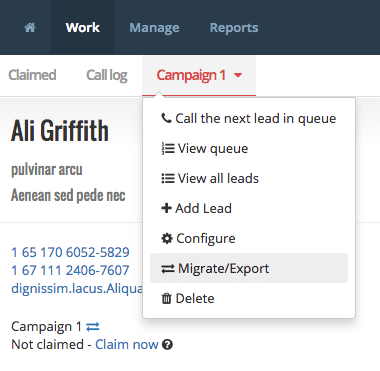 Pro Tip: The export tool can also be used to Migrate Leads Between Lists, so you can create and maintain your own custom pipeline. Access migration from the List context menu.